Description Play the part of a British pilot in World War 1. You are assigned to the 60 Squadron as a new Leader, flying the SE5a. Can you survive the War? Are your piloting skills ready to take on the Germans? This is a Semi-historic static campaign. This campaign is built in BAT with expansion pack 6. The Campaign uses 3 different maps (all included with BAT), at different points CY6's C&C is used, and with the dynamic issues with WW1 the mission briefing will inform you how to work around the simulation. At a minimum, Turn off "No Instant Success, turn OFF Engine Overheat and Turn Off "Map Icons". Start with the Highest Rank to lead the formations. You will be referred to as Lt. within the campaign, this is scripted. At the end of each Briefing, it will tell you which skin to use. This campaign was created with BAT expansion pack 6, I do not know if other versions of the game will work. 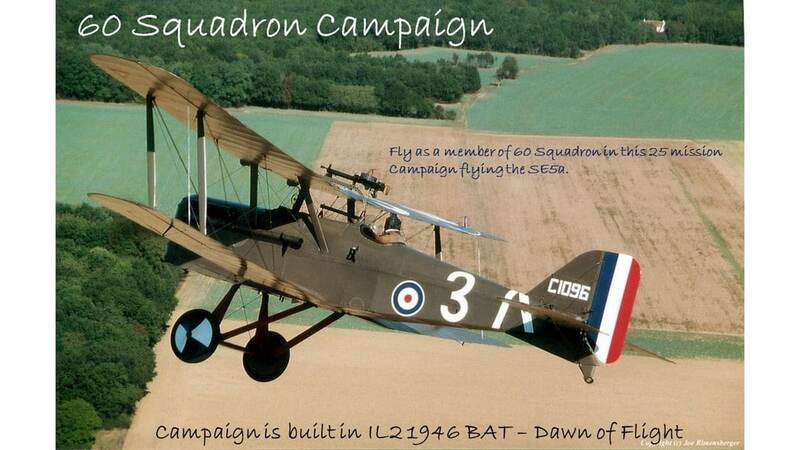 Place 60_Squadron campaign file into Missions/Campaign/GB folder. I hope you enjoy this campaign. Great job mate, and the SE5 upgrades really show here too. Thank you for your efforts. Great job! Great stuff, thanks for creating this. Link not working now. But did get some unasked for advertising. Something amiss here! I just clicked on it and it worked?